If you work in the hospitality sector, you need to look professional and respectable. The right work shirt and uniform will also allow you to do your job with ease. If you work in an office, bar, restaurant or in a hotel EmbroidMe will make sure your look great with quality uniforms and clothing that will last. Our Embroidery Services use the latest technology to embroider your company logo to make sure you promote your brand and corporate identity. EmbroidMe Stores have an excellent range of mens and womens shirts designed specifically to provide comfort, durability and will also look great offering a genuine high street fashion style and fit. Enrich your workplace with sophisticated fashion that will give the right impression for your customers! Here are examples of shirts and uniforms from our supplier The Catalogue. 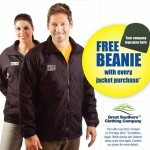 Free beanie with every purchase of a jacket, fleece and vest.